CENTENARY, Ohio — It’s not often you get to show your dominance and resiliency in the same night. 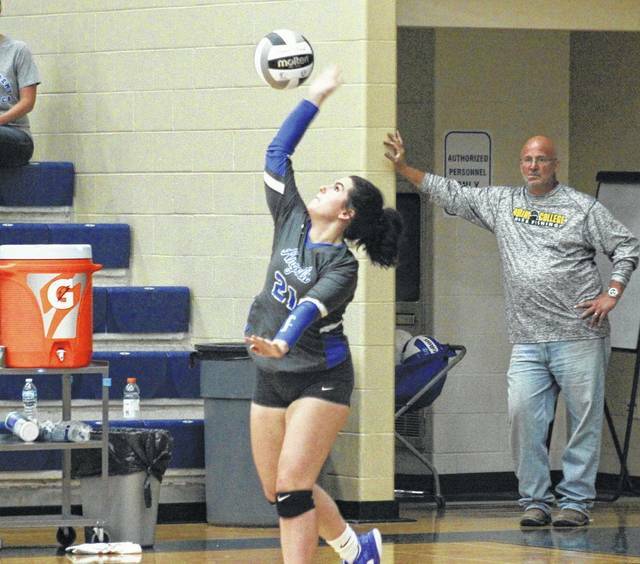 The Gallia Academy volleyball team showcased both in a three-game sweep of Ohio Valley Conference guest Portsmouth, as the Blue Angels claimed victories of 25-21, 25-7 and 26-24 on Tuesday night in Gallia County. Gallia Academy (5-0, 4-0 OVC) never trailed in the opening game, but never led by more than six. Portsmouth(4-1, 3-1) — the last OVC team to defeat the Blue Angels — fought back to tie the first at 14, but surrendered the next six points and eventually fell by four. 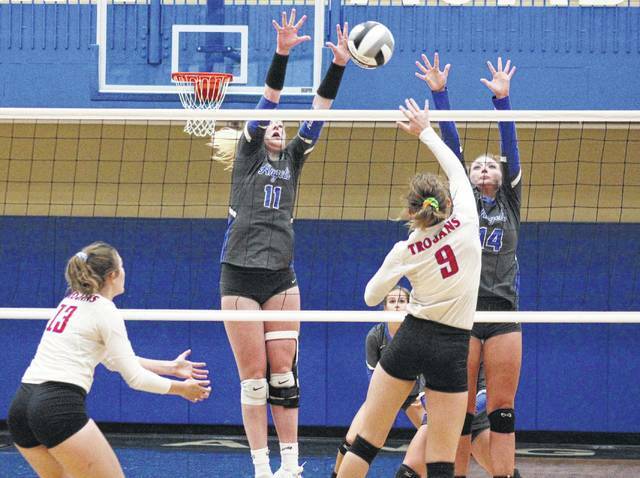 The hosts led wire-to-wire en route to an 18-point win in the second game, allowing the Lady Trojans to record just one service point. After a pair of lead changes early in the third, GAHS opened up a game-high five-point lead, at 12-7. Portsmouth stayed close and eventually strung together a five-point run, giving the Lady Trojans the lead at 24-23, one point away from victory. However, the Blue Angels scored the next three points to seal the two-point win and the 3-0 sweep. GAHS extended a trio of impressive streaks with the win. The Blue Angels have now won 19 consecutive league matches, 57 straight games within the league, and 27 regular season matches in a row. The Gallia Academy service attack was led by the sophomore duo of Peri Martin and Alex Barnes with 13 and 12 points respectively. 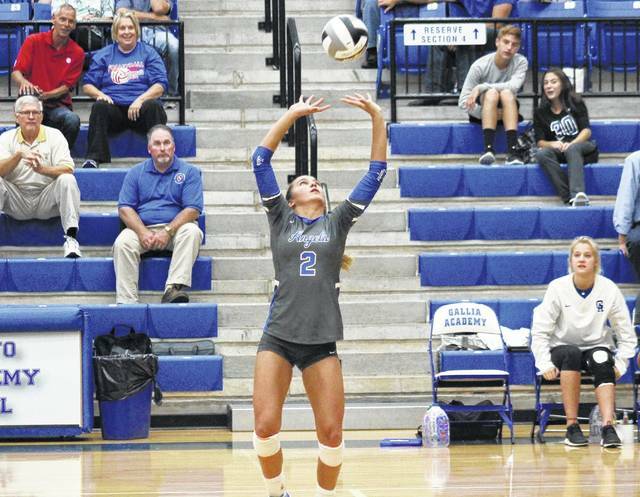 Taylor Burnette and Ryelee Sipple both finished six service points, Hunter Copley added three, while Katie Carpenter and Ashton Webb recorded two points apiece. The Blue Angels will look for a similar result when they visit Portsmouth, on October 3. GAHS returns to action on Thursday, at Ironton. 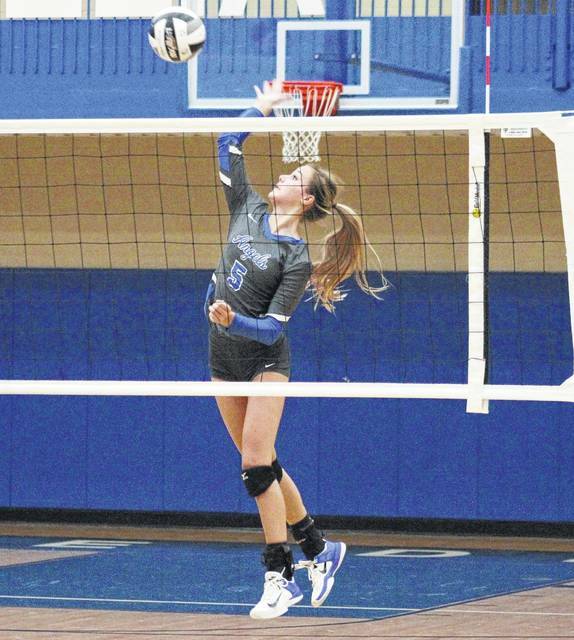 GAHS sophomore Alex Barnes (5) goes up for a spike during the Blue Angels’ sweep of Portsmouth, on Tuesday in Centenary.